Making sundal is very easy. Even though most of us know the recipe for making sundal, this recipe might help the new cooks. 5 years back when I started learning how to cook, frankly speaking I didn't know how to season a simple curry. I used make an international call to ask for help. 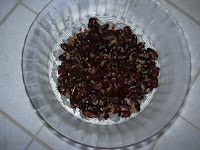 Lets coming back to the recipe, here is the recipe for making rajma sundal. Rajma sundal is very tasty and healthy.a person who wants to implove the quality of food will defenitely follow this receipy.